On the day that Apple announces that they’ve sold a gazillion iPads in the last quarter (and that they can clearly see the near future when more iPads are sold than Windows PCs), I’m going to tell you about my Kindle Fire. Bucking the trend, moi? Wading upstream? Yep, that’s me. There are a couple of reasons why I decided to pre-order a Fire when Amazon announced them last September. The first is obvious: I already had and was using a Kindle (a second-generation, international 3G version) and was very enthusiastic about it. 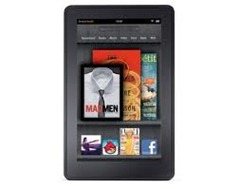 I’ve now read ebooks from Amazon on it, as well as technical books from Pragmatic Bookshelf and O’Reilly. I’ve read PDFs that I’ve downloaded to it. The format is great, the device light, and the ability to sync (WhisperSync as Amazon calls it) across all Kindle devices and apps is awesome. Just before Christmas we found ourselves in some fabric store – stupidly, we’d chosen the “up to 50% off” sale day to go – and I read a third of a book on my iPhone Kindle app while waiting for a fabric cutter. Brilliant. The other great thing about the older Kindle? Annotations and highlights. For novels, meh (although it amazes me that other people have highlighted a Lee Child thriller – “Detection and response. Stage one, stage two. First you spot the threat, and then you react.” – a little creepy, no? ), but for technical books it’s a dream. And the text is searchable, to boot. A technical book on an e-reader is the best thing out. And the other reason for ordering the Fire was the ability to do other things with it. Web, video, games, etc. And in color too! So, on November 16, UPS delivered my Kindle Fire. My opinion? Almost ideal. It’s perhaps a little too heavy for me, although the size is perfect. I much prefer a seven-inch tablet to the iPad’s ten. Like the e-ink Kindle, it’s about the size of a paperback book. Reading e-books on it is great, apart from the slight heaviness. The web browser works just fine for the sites I visit: I can catch up with emails and the feeds I follow in Google Reader just before going to sleep. The speed of its processor is fine for what I use it for; and I’ve never had any touch issues apart from a tendency for the swipe-to-unlock screen to be a bit hesitant. But, then again, sometimes my iPhone does that too. I was already a member of Amazon Prime, so I’ve watched hours of free streaming video from Amazon on it. In fact, way more than from Netflix (we’re subscribers to that too) even though there’s a special Netflix app for the Fire. I’ve also used it to replace my iPod Touch as the device I use on flights to watch my DVDs I’ve ripped. (The iPhone/iPad settings in Handbrake work just fine for the Fire.) The only issue with that aspect is that selecting the video file to watch is remarkably hard (the Fire just displays a captured screenshot of the video – no file name – and, if you’re selecting one from several episodes of a TV series, that can be somewhat awkward). Games? Nope, sorry. Haven’t bought/downloaded/played any at all. Not even Angry Birds. To be honest, that’s not what I bought it for. For me, the Fire is a consumer entertainment device where “entertainment” means videos and books. It’s not for work, although reading tech books is just fine. Mind you, since I wrote about the Fire’s web experience for PC Plus, I can even claim for it on my taxes. Score! So, all in all, an excellent device. Well worth the $199 for the Fire itself, and the $25 for the cover. If I were to compare it to the iPad, the only thing I would say is that you can buy five Fires for the cost of two of the cheapest iPads. No contest. The whole online Amazon experience. WhisperSync, Amazon Prime, ordering content online, the works. Amazon so have this aspect down pat. Great video player, either streamed via Amazon or sideloaded as .M4V files. Could be a little lighter. Speed of the web browser – aka Amazon Silk – with “Accelerate page loading” enabled is still slower than when it’s disabled. WTF? RAM is too small. It should be 16GB at least (or there should be a version with 16GB or more). Uploading with USB is pretty slow. When recharging, the little green power light comes on at 90% full and not 100%. I now ignore it. The keyboard sounds are WAY TOO LOUD. Now permanently turned off.